I remembered Yoo-hoo from years ago, as sort of like a chocolate egg cream, but not nearly as good. I’d supposed that the company had long ago gone out of business, but (as EDZ quickly confrmed on her phone) no; they are still yoo-hooing. Call for it by name. The term Yoo-hoo was first applied to a fruit drink called “Tru-milk”, sold in the 1920s by Italian-American Natale Olivieri in his small soda fountain on Hackensack Street in Carlstadt, [in northern] New Jersey. Olivieri soon found a way to produce a kind of chocolate-milk drink that would not spoil in the summer heat as pure chocolate milk would. 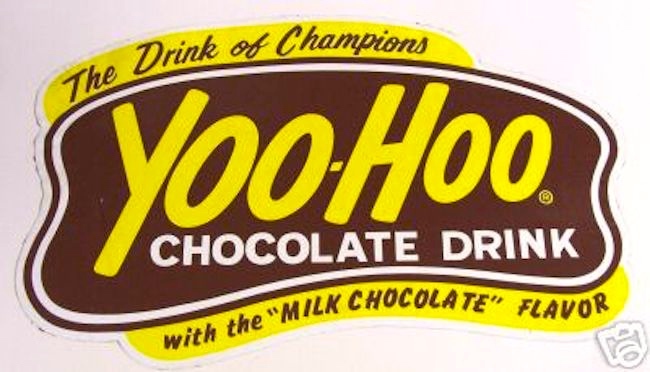 The name “Yoo-hoo” became associated with the chocolate-flavored drink as well. … Yoo-hoo’s several flavors include chocolate, strawberry, chocolate banana, chocolate strawberry, chocolate peanut butter, and chocolate caramel. The drink isn’t a soft drink (or soda or pop or whatever your term is), because it has no carbonated water (with dissolved CO2) in it. excl. yoo-hoo: a call used to attract attention to one’s arrival or presence: Yoo-hoo! — Is anyone there? ORIGIN natural exclamation: first recorded in English in the 1920s. ˈyoohoo v. (also ˈyoo-hoo) (intransitive and transitive) to call ‘yoo-hoo!’ (to). 1948 D. Ballantyne Cunninghams i. iii. 14 He..yoohooed for a chair. 1957 J. Kerouac On the Road i. xiii. 88 Then they yoohooed us. 1978 ‘J. Gash’ Gold from Gemini iii. 24 Patrick yoo-hooed me over to his place. Not just verbed, but converted specifically to a manner-of-speaking verb, usable in a variety of syntactic constructions (some of them illustrated above). Details in my squib “In a manner of speaking” (Linguistic Inquiry, 1971). With a long list of these verbs in Beth Levin’s English Verb Classes and Alternations: A Preliminary Investigation (1993), section 37.3 (Verbs of Manner of Speaking), from babble through yodel, but not including yoo-hoo (the list is indefinitely extendible by neologisms). An egg cream is a beverage consisting of milk, carbonated water, and flavored syrup (typically chocolate or vanilla). Despite the name, the drink contains neither eggs nor cream. The egg cream is almost exclusively a fountain drink. Although there have been several attempts to bottle it, none has been wholly successful, as its fresh taste and characteristic head [or froth] require mixing of the ingredients just before drinking. 1947 I. Shulman Amboy Dukes i. 4 The strollers..stood at the open windows of candy stores .. drinking .. three-cent egg creams. 1988 M. Stewart Quick Cook Menus 213 (caption) This chocolate fizz, served in a ruby goblet in front of a leaded window in the hall, is similar to an egg cream — a traditional New York drink that contains neither egg nor cream. Other sweet soda and milk-based beverages include the Vietnamese soda sữa hột gà, a beverage prepared with sweetened condensed milk, egg yolk, and soda water. Milkis, a beverage made by the Korean Company, Lotte Chilsung, is also a sweet-soda-milk drink. It is a citrusy soda base mixed with a little milk. Milkis comes in a variety of flavors, including strawberry, orange, and muskmelon. A Smith and Curran (or Smith and Kearns) is an alcoholic beverage, developed in North Dakota during the mid-20th-century oil boom, made of coffee liqueur, cream, and soda water. To remind you: a Yoo-hoo has the flavored syrup and the dairy (in the form of milk), but lacks the soda water. A milkshake also has the dairy and the sweet flavorings, but not the soda water. An Italian soda has the soda water and the sweet flavorings, but not the dairy. An ice cream soda / float has the soda water and sweet flavorings (or the two together in a commercial soda, like root beer or Coca Cola), but the dairy is ice cream rather than liquid. Phosphate soda [aka a phosphate] is a type of beverage that has a tangy or sour taste. These beverages became popular among children in the 1870s in the United States. Phosphate beverages were made with fruit flavorings, egg, malt, or wine. In the 1900s, the beverages became popular, and fruit-flavoured phosphate sodas were served at soda fountains, before losing popularity to ice cream based treats in the 1930s. Phosphoric acid is used in many bottled soft drinks, including Coca-Cola. The original acid phosphate, made by the Horsford Chemical Company, was a mixture of calcium, magnesium and potassium phosphate salts with a small amount of phosphoric acid producing a liquid mixture with a pH of around 2.0, the same as freshly squeezed lime juice. Rivella is a soft drink from Switzerland, created by Robert Barth in 1952 [originally produced in a Stäfa (Canton Zürich) factory, which relocated to Rothrist in Canton Aargau in 1954], which is produced from milk whey, and therefore includes ingredients such as lactose, lactic acid and minerals. It comes in seven varieties [Red (original), Blue (low-calorie), Green (with green tea extract), Yellow (plant-derived), CLIQ Peach, CLIQ Rhubarb; plus, very recently, Cranberry and Mango]. … The name Rivella was inspired by the municipality of Riva San Vitale in Canton Ticino and the Italian word for “revelation”, rivelazione. 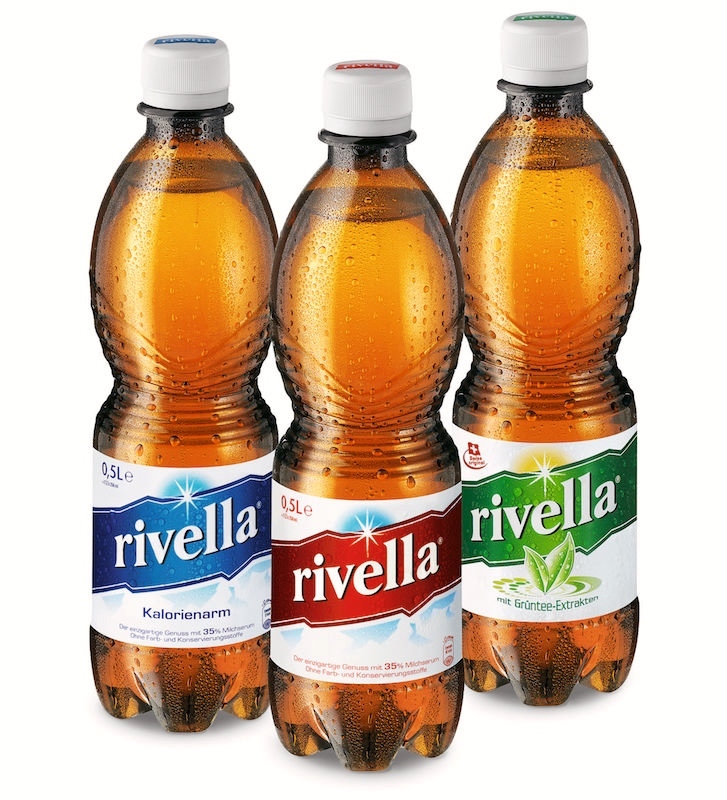 … Rivella is seen as Switzerland’s national beverage. The share by value of Rivella AG in the Swiss soft drinks market was 15.3 per cent in 2013, putting Rivella second to Coca-Cola. It’s got it all: the flavored syrup (fruity rather than chocolate), the soda water, and the dairy. The canton of Aargau … is one of the more northerly cantons of Switzerland. It is situated [along] the lower course of the Aare [which is also Bern’s river], which is why the canton is called Aar-gau (meaning Aare province). It is one of the most densely populated regions of Switzerland. … The capital of the canton is Aarau [population ca. 20,000 in 2011], which is located on its western border, on the Aare. The canton borders Germany (Baden-Württemberg) to the north, the Rhine forming the border. To the west lie the Swiss cantons of Basel-Landschaft, Solothurn and Bern; the canton of Lucerne lies south, and Zürich and Zug to the east. Its total area is 1,404 square kilometers (542 sq mi). It contains [two] large rivers, the Aare and the Reuss. 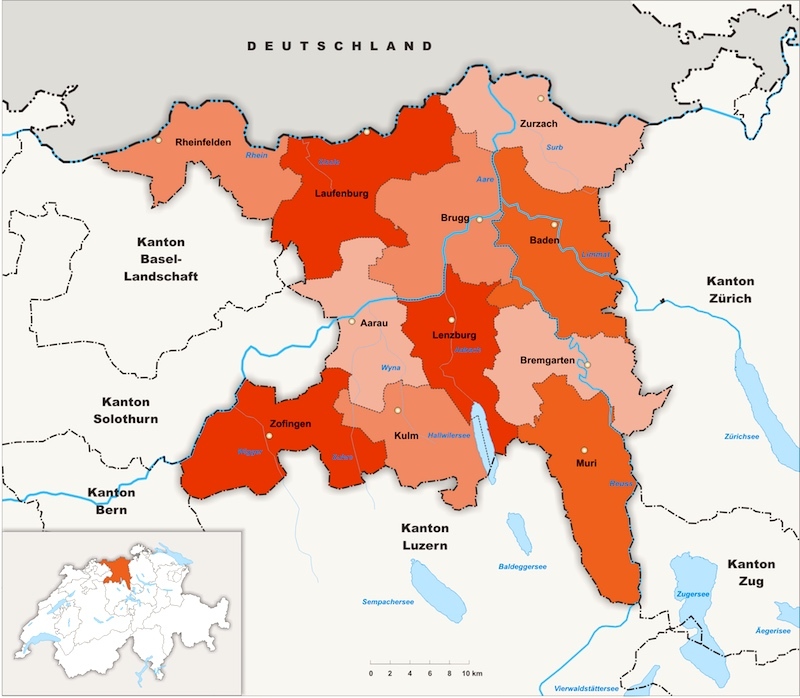 The canton of Aargau is one of the least mountainous Swiss cantons, forming part of a great table-land, to the north of the Alps and the east of the Jura, above which rise low hills. The surface of the country is beautifully diversified, undulating tracts and well-wooded hills alternating with fertile valleys watered mainly by the Aare and its tributaries. The valleys alternate with pleasant hills, most of which are full of woods. The canton appears to be well-supplied with quaint villages, pleasant vistas, the occasional small castle, and growing technology centers, plus of course the Rhine. Just nothing stunning or breath-taking, which in Switzerland makes it seem pedestrian. This entry was posted on December 15, 2018 at 8:30 pm and is filed under Language and food, Language in advertising, Names, Pragmatics, Trade names, Verbing. You can follow any responses to this entry through the RSS 2.0 feed. You can leave a response, or trackback from your own site.